STEP 1: Have you applied to PRCC and submitted all required paperwork? >>Yes. Go to Step 2. >>No. Complete the Admissions Application or contact the Admissions Office at 601.403.1214. STEP 2: Do you want to take all of your classes online? >>Yes. Go to Step 3. >>No. See your Advisor. Click "Find My Advisor" in RiverGuide to see your assigned advisor to register. If you don't have an advisor, make an appointment with a Counselor by going to www.prcc.edu/admissions/counseling. >>Returning Students: See your Advisor. Click "Find My Advisor" in RiverGuide to see your assigned advisor to register. 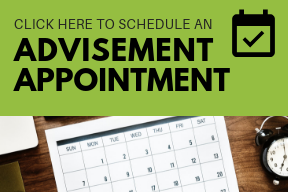 If you don't have an advisor assigned, make an advisement appointment with an eLearning Support Specialist by clicking the image below. >>New Students: Make an advisement appointment with an eLearning Support Specialist by clicking the image below. >>Once you are registered for online classes, you can verify your schedule by logging into RiverGuide. Click on the Wildcat Web icon, then Student->Registration->Select Term->Student Detail Schedule. Note: Once work is completed in online classes, you are charged. Coursework must be turned in each week, or you will be marked absent. This includes during holidays, like Spring Break and Thanksgiving Break.